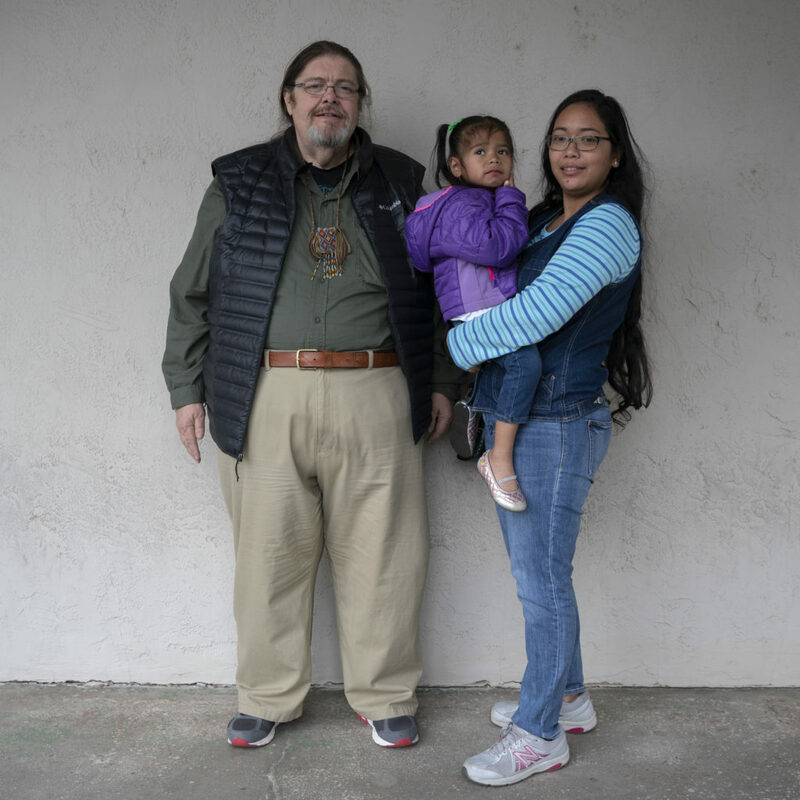 Moigu Standing Bear, 62, his wife Firda Standing Bear, 32, and their daughter Sophia Iris Standing Bear, 5, have recently moved to the United States from Indonesia last year. In 2018 the family decided to visit the United States for a few days, but due to unforeseen circumstances Mr. And Mrs. Standing Bear ended up staying in the country permanently for now. Firda is in the process of getting her immigrant visa on behalf of her United States Citizen husband. Moigu is a Mohegan Native American, born and raised in Connecticut. He was once chief of a tribe for many years. He was involved in tribal politics, teaching tribal customs and traditions as well as being president of the National American Indian Defense Association. Moigu was also a chief of a tribe for many years. He was involved in civil rights issues for Native Americans. He was much very involved in helping the Indian tribes and helping his people. He eventually decided to move to Indonesia in 2008 to work as a teacher in education, which he did for 10 years. Firda was born and raised in Surabaya, Indonesia. She worked in many jobs, but before meeting her husband she worked with a musician crew. “That’s how I can connect with him through songs actually, we discuss about songs and music, he is also a singer in his tribe as well, we talk about music a lot, and that’s how we have a our click toward each other,” she said. Moigu helped his wife get a job as a teacher, which she loved very much after teaching and working with children. Firda’s immigration process is a little bit more difficult than the ordinary immigrant. She is trying to get legal status within the United States, but if she were to get deported, she wouldn’t just get sent to the border, she would actually get sent back to Indonesia. Her only option now is getting her work authorization as soon as possible to avoid any apprehensions and thus any deportations from Customs Border Patrol. “I never thought immigration was going to be that difficult,” he said about our immigration system. “I think we have it all to thank, is Mr. Trump who’s made things very difficult for anybody to migrate to this country,” he said. Moigu and Firda, along with their daughter Sophia, went thru very difficult times at their arrival in this country. Upon arrival they were staying with Moigu’s friend, but ended up at a shelter in Santa Fe, New Mexico because they were unable to return to Indonesia. Moigu is under medical treatment for heart and liver failure. His doctor prohibited any air travel due to his heart condition, and for this reason they cannot return to Indonesia. They hope she can get her legal status soon, as they don’t plan on a separation for any reason. “The thing is I don’t know how I’m going to feel leaving my daughter here, I don’t know how he’s going to feel taking my daughter with me, so we’ve never separate in our 10-year marriage, so we like to stay as a family,” she said. Juan Ramon Lopez, 36, and his son Juan Jose Lopez, 15, come from Salama, Department of Baja Verapaz in Guatemala. Juan Ramon leaves behind his wife and three children. His journey through Mexico lasted 12 days until he reached Ciudad Juarez, the border of Mexico- United States. Juan Ramon and his son Juan Jose traveled through Mexico with a guide or “coyote”, to whom they paid $4,500 dollars for their services. During their journey, they traveled by freight car, bus, and private vehicle. “It was very difficult. We were placed inside a freight car with a capacity of 30 people, but we were 50, with no food for a day and a half, we had to sleep on the floor of an outdoor vacant land,” he said. In a few occasions they were detained by law enforcement and the federals, which they had to bribe so they could let them through. Juan Ramon had previously been in the United States in 2008. He had entered with a work visa through a company who had told them, that once in the United States, they would be able to renew their work authorization. When it was time to renew their work visa, the company informed them that they were not going to be able to help them. Due to the economic recession and the lack of work permit, he had to return to his country of origin. “Maybe if i had done well, I wouldn’t of have left, because we all come here with the intentions of being able to be self-sustaining in this country,” he said. The violence in Guatemala is very strong and very dangerous. Juan Ramon told us, that you can be driving on the highway and be assaulted at any time. “You can be driving down the highway, and even after driving a good motorcycle with a strong cylinder capacity, they will cut you off with a vehicle, and assault you at gunpoint, and it’s worse in the Capital City,” he said. The “Mara Salvatrucha” gang, has been known to be very dangerous, in Mexico as well as all Central America. Much of this violence is due to this gang, and unfortunately in some parts of Guatemala it continues to grow. 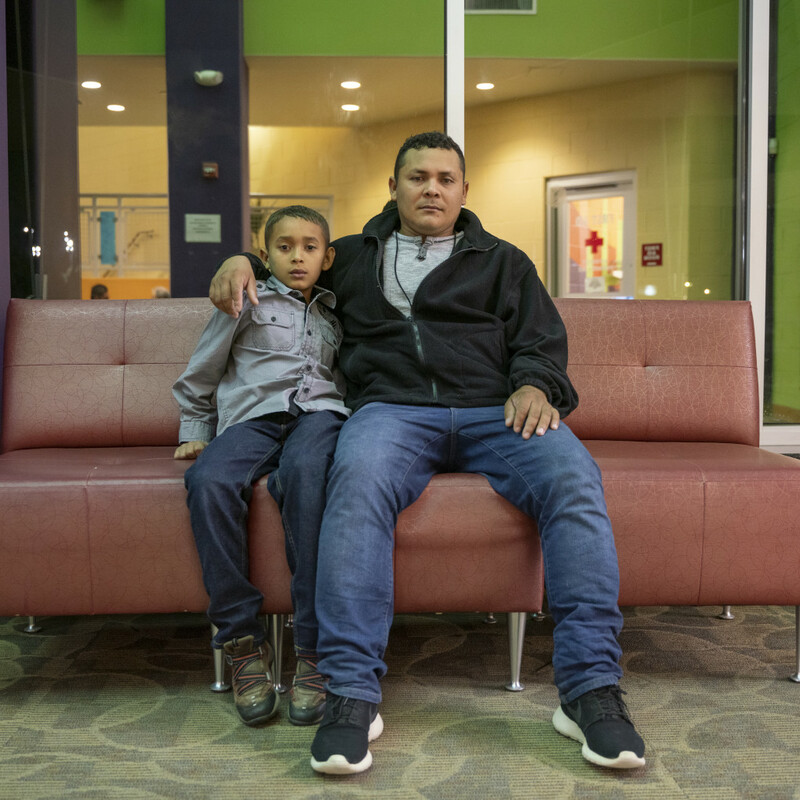 Juan Ramos speaks a little English, and he would love to continue learning the language and his son Juan Jose is interested in being an electrician and his desire is to study so he can work in this field. They were apprehended by border patrol and were detained for 3 days. Now that they have been released, they will be going to Houston, Texas where his brother is waiting for them. Juan Ramón Lopez, 36, y su hijo Juan José López, 15, son de Salama, Departamento de Baja Verapaz, en Guatemala. Juan Ramón deja atrás a su esposa y tres hijos. Su viaje por México fue de 12 días hasta llegar a Ciudad Juárez, frontera de México- Estados Unidos. Juan Ramon y su hijo Juan José viajaron por México usando un guía o “coyote”, al cual pagaron $4,500 dólares por sus servicios. En el trayecto del viaje su transportación fue por vagón, autobus, y carro particular. “Fue muy difícil, nos metieron a un vagón con capacidad de 30 personas, pero éramos como 50, sin comer nada por un dia y medio, nos tocó dormir en el piso en un terreno baldío en intemperie,” dijo Juan Ramon. En varias ocasiones fueron detenidos por los municipales y los federales, los cuales tuvieron que sobornar para que los dejaran pasar. Juan Ramón ya había estado anteriormente viviendo en los Estados Unidos en el 2008. El había entrado con una visa de trabajo por parte de una empresa que les habían dicho, que ya estando en los Estados Unidos iban a poder renovar su permiso. Cuando se llegó el tiempo de renovar su permiso, la empresa les anuncio que no les iban a poder ayudar. Por causa de la recesión económica, y falta de permiso de trabajo, el tuvo que regresar a su país de origen. “Quizas si me hubiera ido bien, no hubiera tenido que partir, porque todos nos venimos con la intención de poder ser auto suficientes en este país,” dijo el. La delincuencia en Guatemala está fuerte, y es muy peligrosa. Nos cuenta Juan Ramón que puedes estar viajando por la autopista y ser asaltado en cualquier momento. “Usted va allí en la autopista y aunque lleve una moto de buen cilindraje, le atraviesan un carro y lo bajan a punto de pistola y en la capital, peor todavía,” dijo el. Se sabe que la pandilla “Mara Salvatrucha” es muy peligrosa, tanto en México como en todo centroamérica. Mucha de la delincuencia proviene de esta pandilla y desafortunadamente en algunas partes de Guatemala la violencia sigue creciendo. Juan Ramón, habla poco inglés pero le gustaría seguir aprendiendo el idioma y a su hijo Juan José le interesa la profesión de electricidad y su deseo es poder estudiar para poder trabajar en esta profesión. Ellos fueron detenidos por la patrulla fronteriza y estuvieron en el centro de detención por 3 días. Después de haber sido liberados, ellos se dirigen a Houston, Texas, donde los espera su hermano. 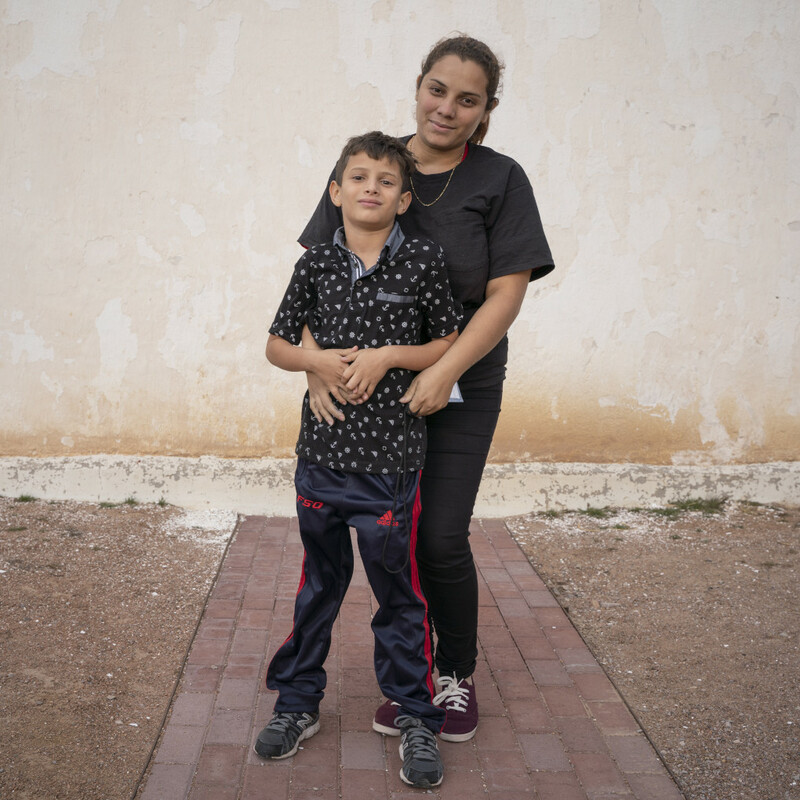 Darling Vargas Picado, 43, and her two kids Eliezer Josue Vargas Picado, 15, and Aurora Tamara Velasquez Vargas, 10, came together from Matagalpa, Nicaragua and were given food and shelter at Our Lady of Purification Church in Dona Ana, New Mexico the day they were released from ICE. They traveled through Honduras, Guatemala and Mexico, to get to the border of Mexico – United States, to seek asylum. Back home, she owned a small ‘pulperia’ or small store selling groceries and general food items. Up until 2018 when the protests against President Daniel Ortega began, everything was going well for her and her business, but after this began the difficulties and the fears. All businesses began to shut down due to the war against the people and the government, and she as well had to close her business. The president of Nicaragua began to decrease social security benefits to the elderly, “The students stood up to the government and began a war in favor of the elderly. Practically a civil war because the students were defending their people. That’s when the war began between the people and the government on April 18, 2019.” she said describing the political situation in her country. Darling would take her daughter to school every day, where she had to pass a barricade, and she would provide food and money to her nephew, whom was part of the protest against the government. Her nephew, eventually fled the country with his family, in fear of their lives. “They (the government) began to search for him and couldn’t find him, they looked for his siblings, his children, his mother, but he had already migrated to another country, so they began to look for his family members, in this came ‘me’, because they saw me giving him food and money while he was barricaded,” she described the situation and her decision in leaving her country. Darling fears of a deportation and an arrest, because, like many migrants that have been deported to her country, in fact, have gone straight to jail for fleeing the country and migrating to the United States. “What we want is to be safe, and then return to our country when the political situation gets better.” she said. Her desire is to maintain her location a secret for fear of prosecution by her government. Darling Vargas Picado, 43, y sus dos hijos, Eliezer Josué Vargas Picado, 15, y Aurora Tamara Velásquez Vargas, 10, vienen juntos desde Matagalpa, Nicaragua, y fueron ofrecidos albergue y alimento en la parroquia de Nuestra Señora de la Purificación en Doña Ana, Nuevo México, el día que fueron liberados por ICE. Ellos tuvieron que viajar por Honduras, Guatemala, y México para llegar a la frontera de Estados Unidos – México a pedir asilo. En su país de origen, ella era dueña de una “pulpería” o en otras palabras un súper mercado donde se venden productos de alimento. Todo estaba bien con su negocio, hasta que comenzaron las marchas en contra del Presidente Daniel Ortega, y después empezaron las dificultades y los miedos. Los negocias comenzaron a cerrar a causa de la polémica entre la población y el gobierno y ella también tuvo que cerrar su negocio. El Presidente de Nicaragua empezó a quitarle los beneficios de seguro a los ancianos, “Los estudiantes se levantan en contra del gobierno y empieza la guerra a favor de los ancianos. Prácticamente una guerra civil porque los jóvenes los empiezan a defender. Es cuando comienza el 18 de abril de 2018 la pelea contra la población y el gobierno,” dijo ella explicando la situación política en su país. Darling llevaba a su hija al colegio todos los días, donde pasaba por un trance, donde le daba alimento y dinero a su sobrino que participaba en las marchas encontrar del gobierno. Su sobrino tuvo que huir de su país con su familia, porque su vida corría peligro. “A él lo comenzaron a buscar (el gobierno) y no lo encontraban, buscaron a sus hermanos, a sus hijos, y a su mamá, pero él ya había migrado a otro país, y comenzaron a buscar a sus familiares, en este caso a mí, porque miraron que yo le llevaba comida y dinero cuando pasaba por el trance,” dijo ella explicando la situación y su decisión en salir de su país. Darling tiene miedo de poder ser deportada y detenida, así como mucho migrantes que han sido deportados a su país y han ido directo a la cárcel por huir de su país y emigrar a los Estados Unidos. “Nosotros lo que queremos es estar seguros, y ya después regresar cuando mejore la situación política en nuestro país.” dijo ella. Ella desea mantener su ubicación en secreto por miedo a persecución de su gobierno. 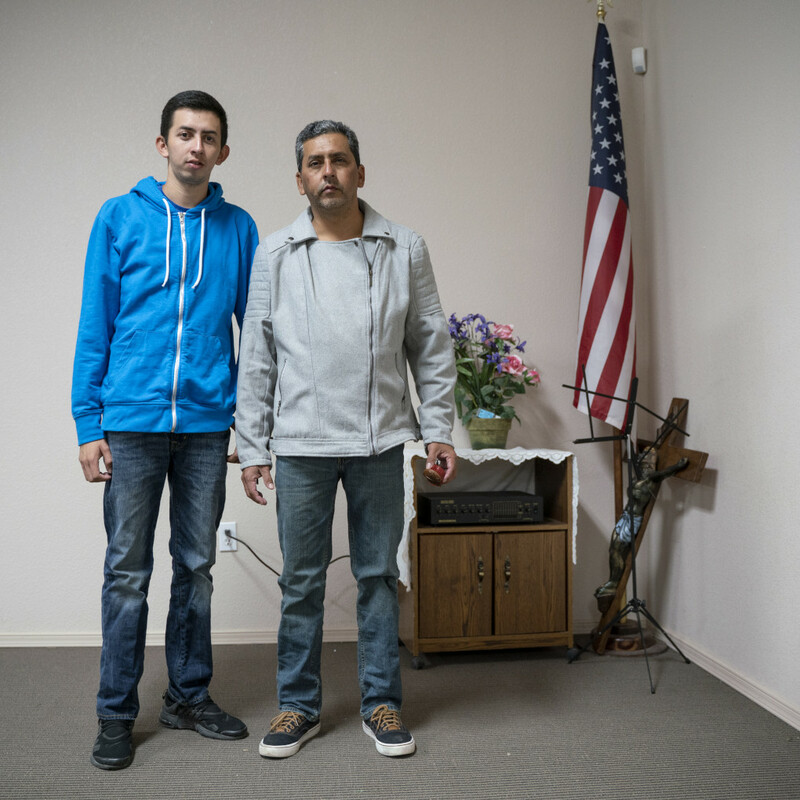 Francisco Dario Lopez, 45, and his son Jeuber Fernandez Lopez, 17, are from the town of San Nicolas in the Santa Barbara Department of Honduras. Like many others from their country, they made the decision to leave out of desire for a better life. They were given shelter and meals at Our Lady of Purification in Dona Ana, New Mexico, as well as given assistance in arranging transportation to their family. Back home, Francisco worked as a carpenter for 29 years. Despite his skills and expertise, the economy of Honduras has slumped so that he does not receive any work. “The road from our country to this country is not easy,” he explained during their trip, they were apprehended in Villa Hermosa, Mexico for 25 days in a compound that they could not leave, then again in Mexico City for 15 more days. They were eventually released, and made their way to the border in Ciudad Juarez. Once they crossed, they experienced a different kind of confinement at the hands of the United States government. “For the three days we were in migration, it was as if we were there for 20,” he spoke of the conditions in the Border Patrol facilities, “like a punishment they turn on the air, as they call them, ‘hieleras,’” a term migrants use meaning cooler to describe the holding cells of the Border Patrol. After leaving Our Lady of Purification in Dona Ana, they would head to New Orleans, Louisiana, where his nephews await. Francisco Dario López, 45, y su hijo Jueber Fernández López, 17, son de la ciudad de San Nicolás, Departamento de Santa Bárbara en Honduras. Como muchos otros de su país, ellos decidieron partir, por deseo de una vida mejor. A ellos les ofrecieron albergue y alimento en la Parroquia Nuestra Señora de la Purificación en Doña Ana, Nuevo México, al igual que asistencia para las reservaciones de la transportación para con sus familiares. En su país de origen, Francisco trabajó como Carpintero por 29 años. A Pesar de sus habilidades y su experiencia, la economía en Honduras se a desplomado, hasta el punto donde el no a podido recibir trabajo. “El camino de nuestro país a este país no es fácil,” él explicó que durante su viaje, ellos fueron detenidos en Villa Hermosa, México por 25 días, en un campamento donde no se podían ir, después otra vez en la Ciudad de México por 15 días más. Finalmente fueron liberados, y llegaron a la frontera de Ciudad Juárez. Al cruzar, experimentaron un encierro diferente en las manos del gobierno de los Estados Unidos. “Estuvimos en migración por tres días, pero se sintió como si fueran 20,” el hablaba de las condiciones de la detención de la patrulla fronteriza, “como castigo encendían la calefacción, por eso les llaman ‘hieleras’,” un palabra usada por los migrantes refiriéndose a las celdas de la patrulla fronteriza. Después de dejar la Parroquia de Nuestra Señora de la Purificación en Doña Ana, se dirigen a Nueva Orleans, donde los espera sus sobrino. 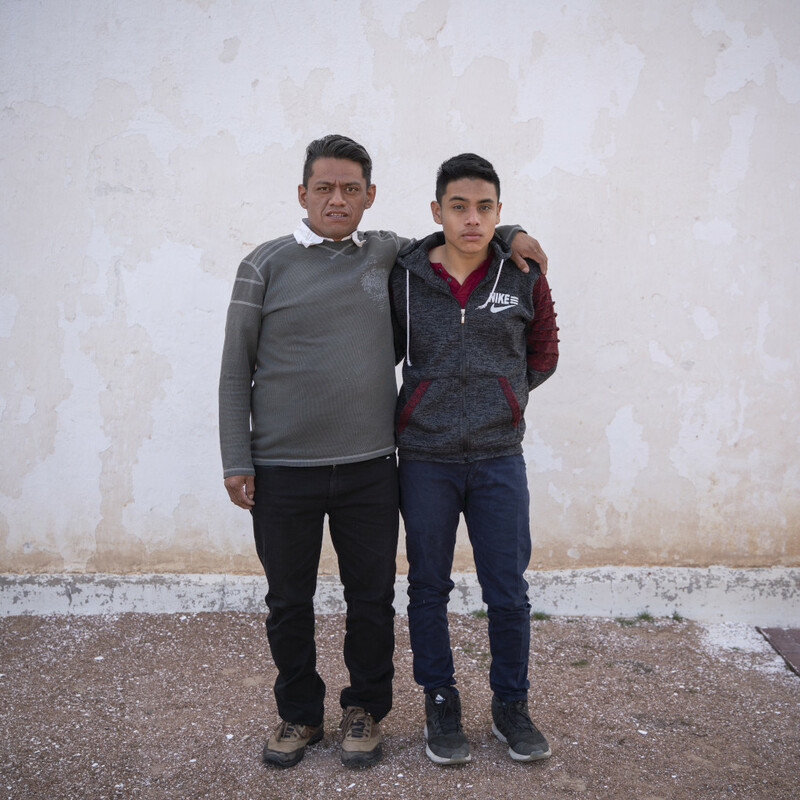 Erduin Euceda, 29, and his son Erduin Fabricio, 10, from Colon, Honduras, came to the US-Mexico border to find a better life. They spent 14 days traveling through Mexico on their own, and upon being apprehended by the Border Patrol, spent about three days in detention. Upon being released they were taken in a large group to Our Lady of Purification in Dona Ana, New Mexico. This parish participates in a program called Project Oak Tree, which offers assistance to migrants released by ICE. The group will help them book plane tickets with their families who pay for their tickets. In addition to economic difficulties, his locale of Colon has grown more and more dangerous with crime. It is an atmosphere which is difficult to raise children in. In Honduras, he worked worked in construction, but there was not enough work there. He couldn’t afford to pay for basic things like sending his kids to school, and saving for the future. He decided to make the trip to the United States, leaving behind his wife and two other kids. His destination is Connecticut, where he must first report to the local ICE field office. If he and his son will be allowed to stay legally is yet to be determined. Erduin Euceda, 29, y su hijo Erduin Fabricio, 10 de Colon, Honduras, llegaron a la frontera de Estados Unidos – México en busca de una vida mejor. Viajaron por México 14 días sin ayuda, y al ser detenidos por la patrulla fronteriza, estuvieron en detención migratoria por tres días. Cuando fueron liberados, los llevaron juntamante con un grupo bastante grande a la Parroquia de Nuestra Señora de la Purificación en Doña Ana, Nuevo México. La parroquia participa en el proyecto “Project Oak Tree”, que ofrece asistencia a migrantes dejados en libertad por ICE. El grupo los asistirá con las reservaciones de vuelo que han pagado sus familiares para que puedan viajar. En adición a las dificultades económicas, el estado de Colon a aumentado mas y mas en peligro a causa del crimen. Es una atmósfera muy difícil para criar a los niños. En Honduras, trabajaba en construcción, pero no había suficiente trabajo. No le alcanzaba para comprar las cosas básicas como para mandar a sus hijos a la escuela o para ahorrar para un buen futuro. Decidio hacer el viaje a los Estado Unidos, dejando atrás a su esposa y sus otros dos hijos. Su destino es Connecticut, donde necesita reportarse a ICE en la oficina local. Todavía está por determinarse, si su hijo y el seran permitidos quedarse legalmente en este país. 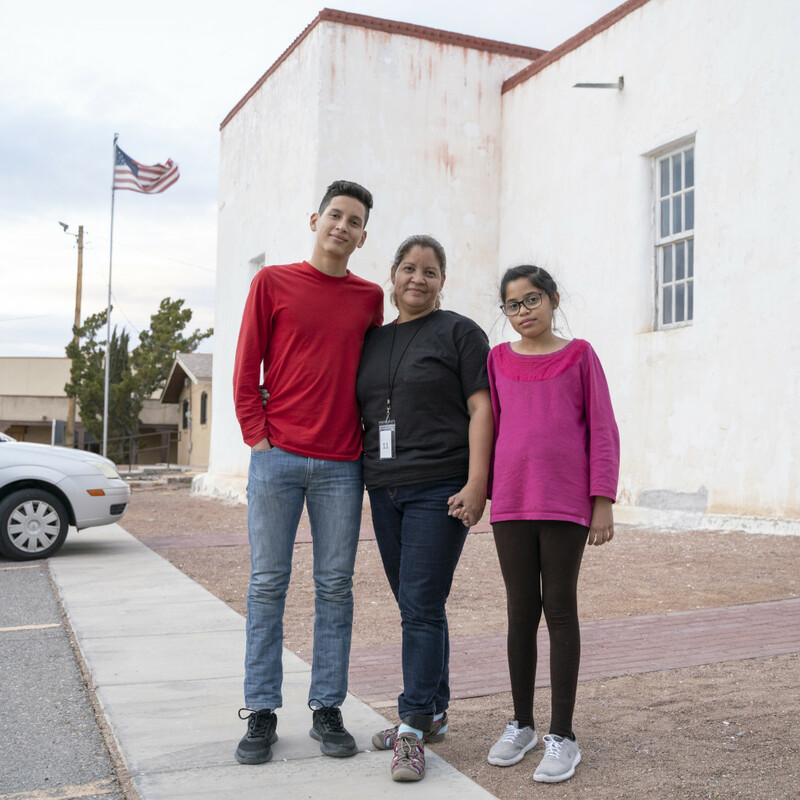 Brenda Marisol Xalin Sutuj, 21, her Husband Alex Anibal, 21 and son, Kevin Alexander, 1, were welcomed in Our Lady of Purification Parish in Dona Ana, New Mexico, and given hospitality the day they were released by ICE, in mid March of 2019. The young family traveled 5 days with the help of Coyotes paying about 90,000 Quetzales ($12,000) for the trip. This money was taken as a loan using her father’s house as collateral. From San Martin Jilotepec, in the San Marcos department of Guatemala, Brenda grew up speaking the indigenous Kaqchikel language, but speaks Spanish fluently, and studied education at the university, where she met her husband. Alex studied in the same program she did, but couldn’t find a job in education, and ended up doing agriculture work earning 50 Quetzales per day to support his pregnant wife. “We all studied,” she said speaking of her siblings, “It is the best option there is in Guatemala.” However this wasn’t enough for them, earning such meager salaries, and to make it all worse, the competition for jobs is high because they are few and far. “When we arrived, we felt at peace because we passed.” speaking of being taken in by the volunteers of Our Lady of Purification in Dona Ana.“Its hard because when you are in the ‘hielera’ it feels like the day won’t go by because you are locked up, and you cant see the sun or know what time it is,” she said about their three days in immigration. 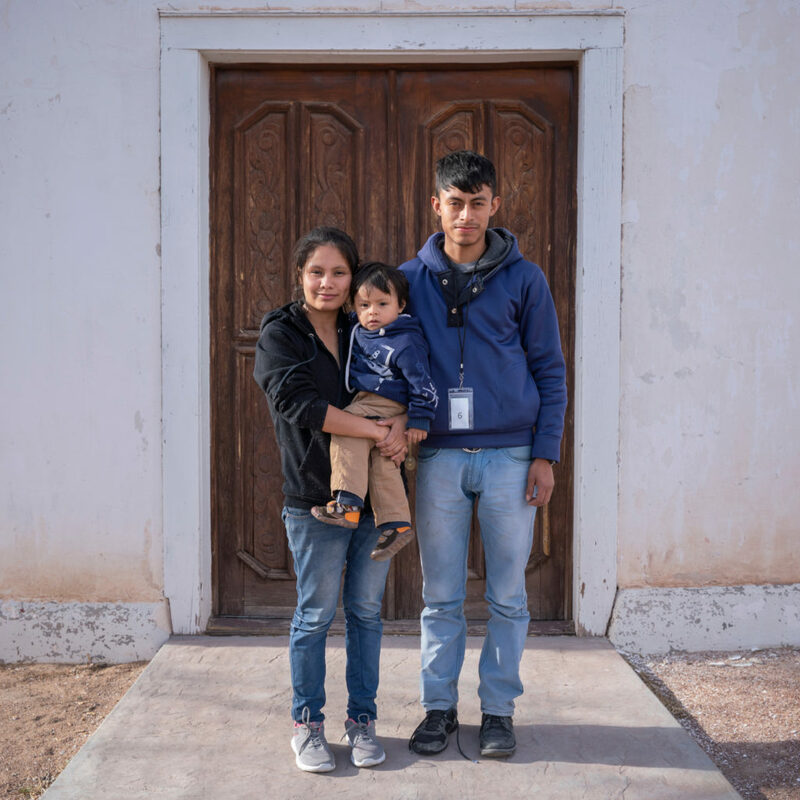 Brenda Marisol Xalin Sutuj, 21, y su esposo Alex Anibal, 21, y su hijo Kelvin Alexander, 1, fueron recibidos en la Parroquia Nuestra Señora de la Purificación en Doña Ana, Nuevo México, y les dieron refugio el día que fueron liberados por ICE, a mediados de marzo del 2019. La pareja joven, viajó 5 días con la ayuda de un coyote, pagándole 90,000 quetzales ($12,000) por el viaje. De San Martin Jilotepec, Departamento de San Marcos, en Guatemala, Brenda creció hablando en lenguaje indígena Kaqchikel, pero habla el español con fluidez, y estudió educación en la Universidad, donde conoció a su esposo. Alex estudió en el mismo programa que ella, pero no pudo encontrar trabajo en educación, y termino trabajando en agricultura ganando 50 quetzales por día para mantener a su esposa en cinta. “Todos nosotros estudiamos,” dijo ella hablando de sus hermanos, “Es la mejor opción que hay en Guatemala,” Sin embargo, esto no era suficiente para ellos, ganando un salario tan bajo, y para empeorar la situación, la competencia de trabajo es mucha porque los trabajos son pocos y muy retirados. “Cuando llegamos aquí, nos sentimos en paz porque ya habíamos pasado,” hablando de los voluntarios que los recibieron en la Parroquia de Nuestra Señora de Purificación. “Es difícil porque cuando estás en la ‘hielera’ sientes como si no pasara el tiempo porque estás detenido y no puedes ver el sol o saber que hora es,” dijo ella sobre los tres días que estuvo en inmigración. 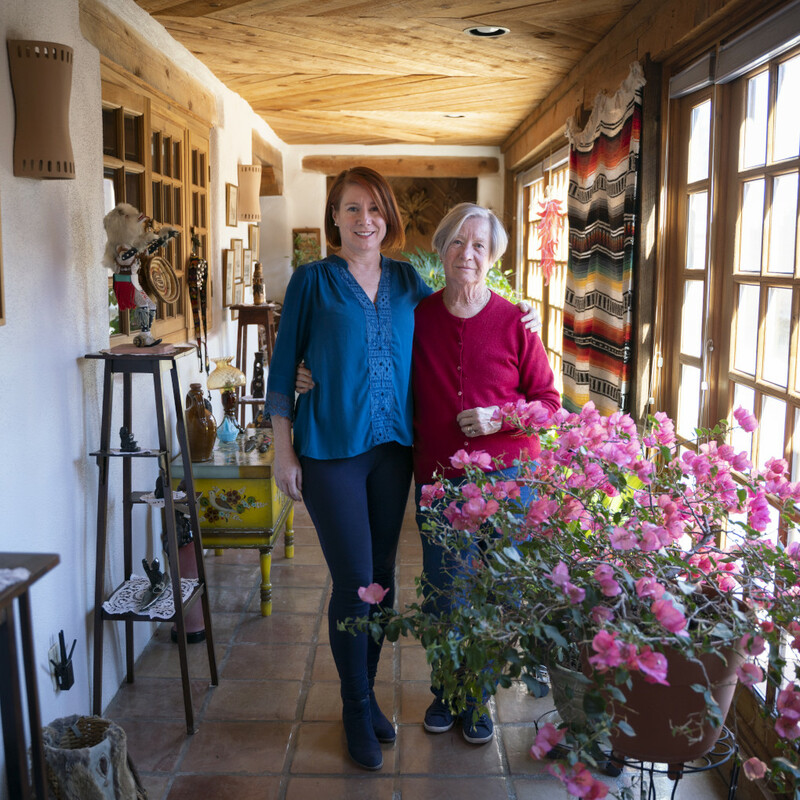 Antonia Goodman, 77, from Italy, and her daughter Melanie Goodman, 48, are pictured in their Mesilla home. Melanie grew up both in Italy and the United States. Born and raised in Bologna, Italy, Antonia, met her American husband there and married in 1969. They came to New York in 1971, but ended up moving to Hatch, New Mexico in 1975. Her husband, a physician of internal medicine, had the choice of working in various rural communities in need of doctors with the National Health Service Core. In 1985, her husband sadly passed away in a car accident, and Antonia returned to Italy with her two daughters. However, in 1989, the sunny skies of New Mexico beckoned Antonia to return to the United States. In the 1970’s, New Mexico was still quite undeveloped in comparison to other parts of the country. “When I left from Florence to New Mexico, I put in my trunk 25 liters of oil!” she said speaking of olive oil, which she couldn’t find anywhere in rural New Mexico, “I need to get oil, at least to get re-accustomed to the United States.” For Antonia, this was the biggest problem she had adjusting to the United States. As an avid Italian cook, she couldn’t acquire ingredients for her favorite recipes. “What goes around comes around,” she warned, “We think we are so superior to everybody,” speaking of the current state of the country. Antonia Goodman, 77, es de Italia, y su hija Melanie Goodman, 48, están fotografiadas en su casa en Mesilla. Melanie creció en Italia al igual que en los Estados Unidos. Nacida y criada en Bologna, Italia, Antonia, conoció a su marido americano en Italia en 1969. Llegaron a Nueva York en 1971, pero terminaron mudándose a Hatch, Nuevo México en 1975. Su esposo, médico de medicina interna, tuvo la opción de trabajar en varias comunidades rurales por la necesidad de doctores con el Cuerpo de Servicios de Salud Nacional. En 1985, su esposo tristemente falleció en un accidente automovilístico, y Antonia regresa a Italia con sus dos hijas. Sin embargo, en 1989, los cielos asoleados de Nuevo México, atraen a Antonia a regresar a los Estado Unidos. En los años 1970, Nuevo México todavía estaba bastante sin desarrollar en comparación a otras partes del país. “Cuando yo me mudo de Florencia a Nuevo México, ¡llene mí cajuela con 25 litros de aceite!” dijo ella refiriéndose al aceite de olivo, que no pudo encontrar en ningún lugar en el Nuevo México rural, “Yo necesito aceite, al menos para re acostumbrarme a los Estados Unidos.” Para Antonia, este era el mayor problema para poderse ajustar a los Estados Unidos. Como una apasionada cocinera italiana, no podía conseguir los ingredientes para sus recetas favoritas. “Lo que siembra, se cosecha,” ella alertó, “Pensamos que somos tan superiores a todos,” hablando del estado actual de este país.